Dirge is total win because his wings are completely reworked. 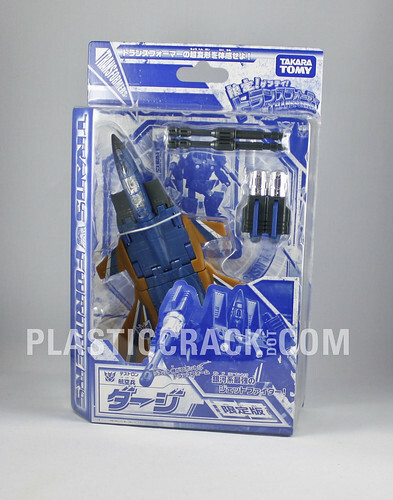 Not just a Ramjet repaint like the Botcon version. And you know I kinda love the striping. I know it's not GeeWon but still. I am going to put him with the Hasbro Classic since that one has (somewhat) fun colours too, and keep the Henkei Ramjet with the Botcon reissues. This page contains a single entry by Nala published on June 11, 2009 5:08 PM. TakaraTomy Disney Label Mickey Prime (Black & White Version) was the previous entry in this blog. Henkei Thrust is the next entry in this blog.